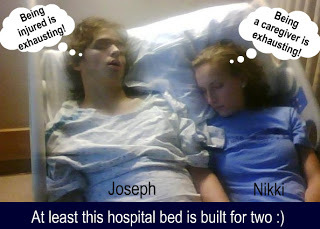 If Joesph’s temperature stays down, he can come home tomorrow! All his tubes and lines have been removed. He’s on an oral pain killer and after he took that, he said he only has a little bit of pain. He’s eating and walking – he walks slowly and carefully, but is happy to be up. He wondered why he couldn’t just go home today because he didn’t sleep well last night. He has a roommate now – a dear sweet older gentleman, that talked half the night. Hopefully he can sleep better tonight and then sleep in his own bed tomorrow night! Thanking God for the way he created our bodies that they can heal. And thankful for the people, skills and technology here at Lehigh Valley Hospital. Cute pic and very accurate! So glad to read good news! Will continue to pray as he recovers at home….